The road from Cairns to Port Douglas is a picturesque trip, winding along the Coral Coast with vistas out of the Coral Sea. Rainforest rolls down from the towering mountains and the road hugs the waters edge, passing many beautiful beaches along the way. When you arrive you’ll discover Port Douglas is actually an isthmus jutting out into the sea, flanked on one side by Four Mile Beach, a sweeping crest of sand fringed by palms and more than a few absolute beachfront homes (we’ve picked the best in the pages to come.) 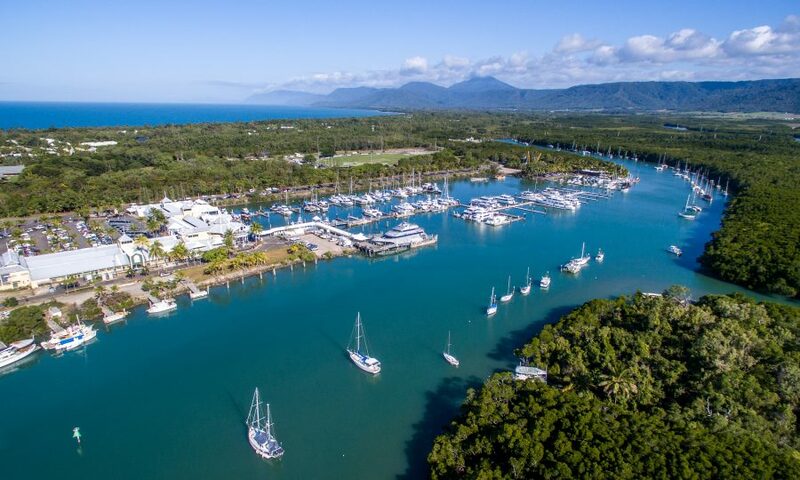 On the other, Dickson Inlet leads into Port Douglas’ exclusive Marina Mirage. At the tip of the isthmus, the town of Port Douglas centres on Macrossan Street, an avenue of style and panache with boutiques, award-winning restaurants and galleries. If you arrive a little ruffled and are in need of some pampering, try Port Douglas Day Spa for some tropical spa treatments that will quickly acclimatise you to the relaxed, laid-back Port Douglas rhythm. Behind Macrossan Street lies Flagstaff Hill, offering a stunning vista over Four Mile Beach from the lookout. One the way, you’ll pass some of the most exclusive homes on streets such as Murphy Street, which enjoy views over port Douglas, the Marina and the mountains beyond. Every Sunday, crowds gather for the ANZAC Park Farmers’ Market just at the end of Macrossan Street. Here under the shade of the giant mango trees, and with beautiful St Mary’s church and the Coral Sea as the backdrop, you’ll find a lively cornucopia of goodies from local arts and crafts to tropical fruits (sample a Black Sapote or a Purple Mangosteen for an unforgettable flavour sensation). Marina Mirage is your springboard to the Great Barrier Reef, with tours of all descriptions departing daily. Low Isles, deep sea fishing, snorkeling the underworld – whatever the aquatic adventure, you’ll find it here. You can hit the Marina shops or perhaps just wander around admiring the yachts and chatting with yachties from around the world. For golf enthusiasts, there are a range of courses, including at the Mirage Country Club and Peppers Links. Every May. Port Douglas gets into party mode with Carnivale, a celebration of tropical culture, lifestyle, food and the arts. Cinema under the stars, fireworks, the Macrossan Street party and the ‘Taste of Port’ where you can sample superb food in the park with views over the Coral sea are just some of the activities on offer. Outside Port Douglas there are some very special private beaches that we just love the solitude and peace they offer. Oak Beach is just before Port Douglas, and is home to some beautiful beachfront homes and Thala Beach Resort. Most people whiz past and miss Oak Beach, and as a result it is a peaceful private beach just perfect from hiding from the world. Just a short drive to the north of Port Douglas, past Mossman, is Newell and Wonga Beaches. Both are picturesque, quiet beaches that offer a hint of how things must have been up and down the tropical in days gone by. Here, you can live out a beachcomber’s fantasy and slip into Port Douglas for a bite to eat or perhaps a cool dip in Mossman Gorge. Cassowary lies just behind Port Douglas, in the rainforest foothills, with endless views across the hinterland and the Coral Sea. Port Douglas offers a unique blend of action and adventure, rest and relaxation, culture and cuisine and begs the question: why travel overseas this year?